I finished my first Primavera sock on the plane out to Seattle and started the second. I am fantastically happy with this project, but the second sock will be put on hold for a while while I start a very fulfilling project to fill a need. Cryptic, I know. But I can't wait to write about it later. 1 You have inspired me, you know. You and that sock-knitting blog you linked to a week or two ago. I have now decided that I absolutely MUST learn how to knit so that I can learn how to knit socks. I'm giving my first sock a try; started last night. I'm sure my first set will be terrible and probably unwearable, but it will be a learning experience. 2 Leofwende, I know the temptation to emulate Sarah can be overwhelming, but please don't neglect your art. I love your self-portraits and would like to see how you'd depict other people. Amaravati already has one Sovereign of Socks. It needs a Princess of Paintings. But never mind what I want. Learning new skills is always a good thing. Best of luck with your first pair! Sarah, Cryptic, I know. And you also know that hint-dropping is a tried-and-true technique to keep your readers hooked. We'll be back every day in hopes of seeing the unveiling of The Project. How do you pick projects? 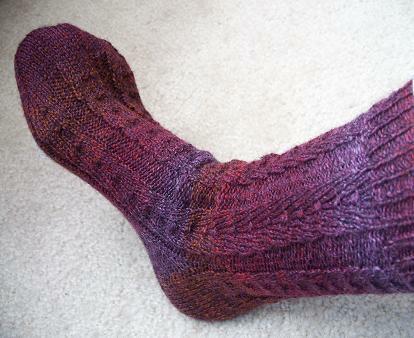 The Primavera sock is on a year-old blog post. (Not that beauty is ever out of date!) Do you mostly find ideas through random websurfing, or is there a pattern of patterns? 3 Usually through random web surfing. I also pick out patterns much faster than I can actually make the items, so sometimes I have patterns backlogged for years. I saw the Primavera socks by random and thought they'd be a good fit for this particular yarn I had. There is a clearinghouse of patterns called Knitting Pattern Central, which is a good place to start a web crawl. 4 what kind of yarn is that? So pretty! 5 The photos are nice, but your readers should know they do not do the sock justice! Can't wait to see what needs you're filling!!! 6 Thanks, Amritas. I have done a few paintings since then; I just haven't gotten around to posting pics of them. Knitting/crocheting is something I can take with me on the bus to and from work. Oil paints? Mmmm...not so much. Next year, when I'm no longer working a long bus ride from home and when my husband is deployed, I will probably do a lot more art. But for now it's only here and there. 7 Leofwende, D'oh! Didn't occur to me that you can't paint and commute at the same time! Nor can you simultaneously commute and Photoshop. It's odd that I forgot about the mobility factor, since I insist on maximum productivity. Just sitting on the bus doesn't sit well with me; I have to do something. Unfortunately, what I do isn't as visible or as beautiful as Sarah's Primavera sock. Or your paintings. Do post some more; I look forward to them. 8 how many single socks do you have around the house waiting for a knit mate? 46kb generated in CPU 0.04, elapsed 0.1994 seconds. 49 queries taking 0.1765 seconds, 206 records returned.